Dehydration is a condition where the loss of water in a dog’s body exceeds the amount that the dog is able to take in. 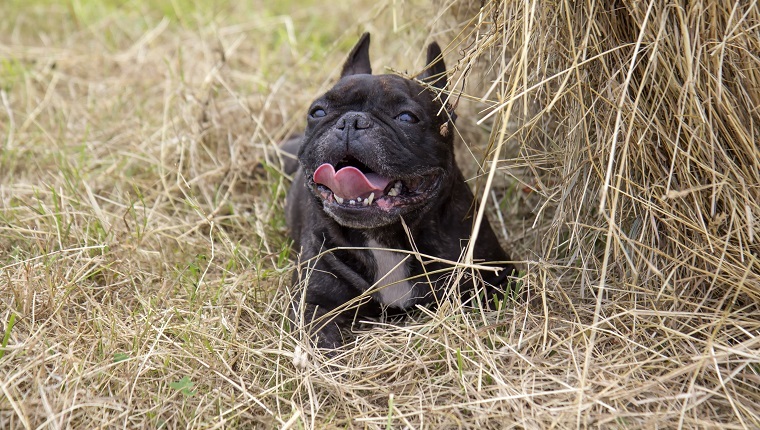 Dehydration symptoms appear when the blood volume drops and the dog’s body starts drawing water out of cells, resulting in a loss of electrolytes. These symptoms can begin with mild panting and dry nose or mouth and escalate to vomiting, illness, and death if left untreated. 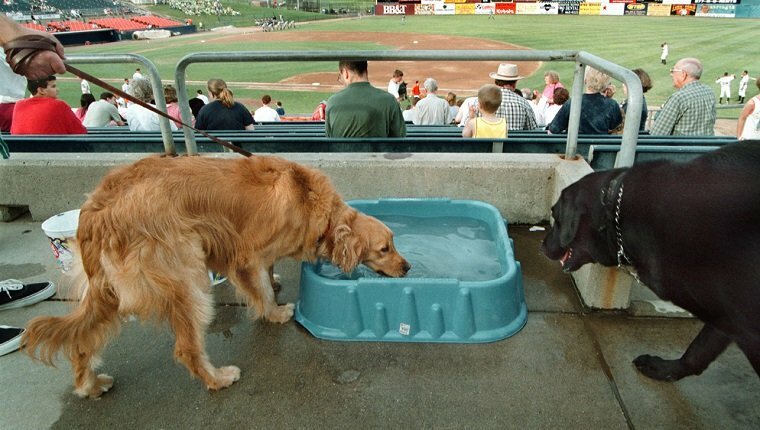 This is why it is so important for dogs to have access to water and maintain hydration. If you see the signs of severe dehydration in your dog or if your dog’s ability to take in water has been compromised, get to an emergency veterinarian immediately so they can form a treatment plan to restore water and electrolytes in your dog’s body. Here is what you should know about the symptoms, causes, and treatments for dehydration in dogs. Symptoms of dehydration in dogs may begin mildly at first, but can quickly progress to signs of severe illness. Vomiting and diarrhea can further exacerbate the condition. The most common sign of dehydration is a loss of elasticity in the skin. You can test your dog for dehydration by lifting a small area of skin on your dog’s back. If it fails to snap back into place after one to two seconds, your dog may be dehydrated. When symptoms are mild, you may be able to give your dog water. However, if symptoms are becoming severe, you may need to seek emergency veterinary care to replace hydration and electrolytes. Here are a few of the symptoms you might see in dogs suffering from dehydration. There are many possible causes of dehydration in dogs. The most common cause people think of is overheating and perspiration, mainly through the paws, associated with exercise or exposure to dry weather. Dogs that are not adequately hydrated during strenuous activity or dry weather, which can even happen in winter, may suffer from dehydration. Dogs may also become dehydrated after vomiting or suffering from a bout of diarrhea. These result in a quick loss of fluid in the body that can become dangerous. Illnesses can cause vomiting and diarrhea or further contribute to the loss of fluid in the body if they result in excessive urination, fever, a decrease in appetite or thirst, or excessive panting. Certain conditions, such as kidney disease, diabetes, and some cancers are also known to cause dehydration. Dogs that are very young or old, dogs that are pregnant or nursing, and small dog breeds are at increased risk for dehydration. The best treatment for dehydration in dogs is prevention. 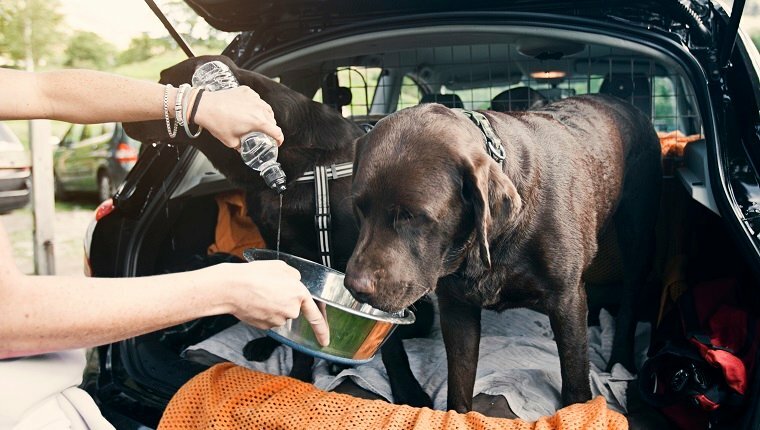 Make sure your dog has plenty of water available at all times, especially during exercise or dry weather, and if your dog suffers from an illness that is known to cause dehydration, ask your veterinarian for tips on how to keep your dog hydrated. When dehydration symptoms are mild, dogs may be treated with access to water and solutions that replenish electrolytes. If your dog shows symptoms that are moderate to severe or if your dog is unable to drink on their own, you should take your dog to the veterinarian for emergency treatment. 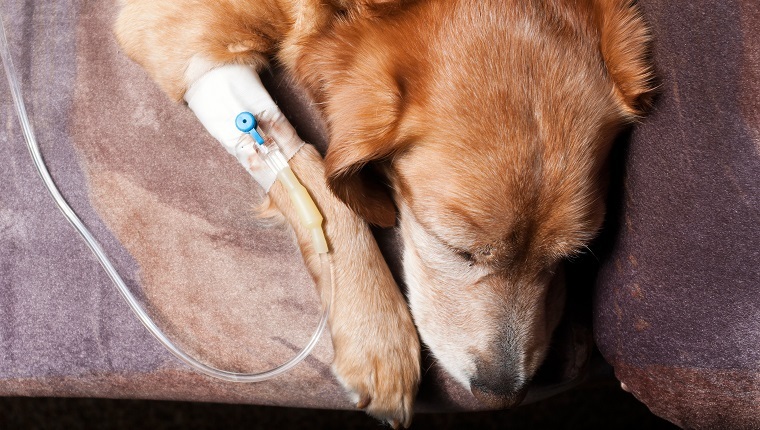 This will likely include intravenous fluid, which will replace and prevent the loss of more fluids from your dog’s body. Usually, the intravenous fluids are given over the course of 24 to 48 hours. Has your dog ever suffered from dehydration? How did you treat it? Let us know in the comments below!